The company currently known as Odakyu can trace its roots back before the war to a rail company owned by Kinugawa Hydroelectric. After being absorbed by Tokyu railways during the war, Odakyu managed to separate itself and establish its own new company in 1948. The name "Odakyu" is a shortened form of Odawara Kyuko or Odawara Express which was the name of the company when it was established. Currently, Odakyu owns three lines; the Odawara line, the Enoshima line and the Tama line. The Odawara line runs from Shinjuku station in Tokyo to Odawara station in Kanagawa prefecture. It is one of the most crowded train lines in all of Japan. The Enoshima line runs from Sagami-Ono station to Katase-Enoshima station, both in Kanagawa prefecture. The Tama line runs from Shin-Yurigaoka station in Kawasaki city to Karakida station in Tama city. 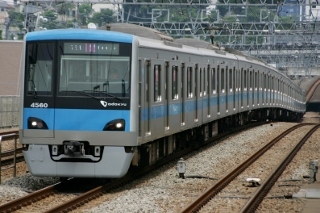 Odakyu is well known for its Romance Car trains which are the equivalent of limited express trains on JR lines. These deluxe trains transport riders from Shinjuku Station to Hakone-Yumoto Station or to Enoshima Station, both tourist destinations. The most well-known of these trains is the Hakone. This train takes passengers from Shinjuku Station to the end of the Odawara Line in Odawara, and then on to the Hakone Tozan Railway which ends at Hakone Yumoto Station. Variations such as the Super Hakone, which makes fewer stops, and also the Metro Hakone, which goes straight through to the Tokyo Metro Chiyoda Line, have also been created over the years.